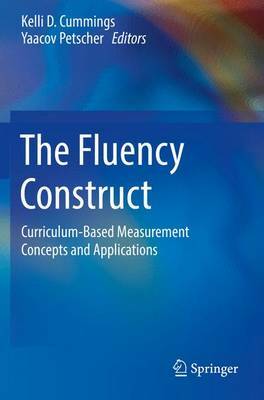 This book provides a comprehensive overview of fluency as a construct and its assessment in the context of curriculum-based measurement (CBM). Comparing perspectives from language acquisition, reading, and mathematics, the book parses the vagueness and complexities surrounding fluency concepts and their resulting impact on testing, intervention, and students' educational development. Applications of this knowledge in screening and testing, ideas for creating more targeted measures, and advanced methods for studying fluency data demonstrate the overall salience of fluency within CBM. Throughout, contributors argue for greater specificity and nuance in isolating skills to be measured and improved, and for terminology that reflects those educational benchmarks. Indicators of fluent writing in beginning writers.Fluency in language acquisition, reading, and mathematics. Foundations of fluency-based assessments in behavioral and psychometric paradigms.Using response time and accuracy data to inform the measurement of fluency.Using individual growth curves to model reading fluency.Latent class analysis for reading fluency research. The Fluency Construct: Curriculum-Based Measurement Concepts and Applications is an essential resource for researchers, graduate students, and professionals in clinical child and school psychology, language and literature, applied linguistics, special education, neuropsychology, and social work.